There can be little more horrifying than a tree which unlocks its roots and begins to move, inexorably. It’s one of Shakespeare’s master strokes in Macbeth, that dread that woods will walk. Tim Burton uses that image, the ancient tree which has entangled itself for generations. While Washington Irving never mentions a burial place in his tale of the headless horseman of Sleepy Hollow, Burton creates the Tree Of The Dead in his film: as a final gruesome resting place for the headless Hessian soldier. Its roots are a veritable haunt of horror, blood-filled and animated as only Burton would have them. He, like Shakespeare, plays on our unease. Today we happened upon a mediaeval abbey. Felix wanted a castle and this was the closest thing. Managed now by English Heritage, Waverley Abbey, in Farnham, Surrey, is a set of breathtaking ruins. Only Henry VIII could have brought himself to ruin such perfection: gorgeous fan vaulted ceilings, great tall abbey walls with towering gothic arched windows, a huge concern which at its height housed 70 monks and 120 laymen, managing fisheries and the fertile lands surrounding the River Wey. It hides from tourists like a self-effacing clergyman: a serene retreat for anyone who sees fit to follow the carp and the butterflies along the river to the sunlit ruins. It was the monks refectory which provided the perfect perch for our stuff, just above the dog’s nose height. We sat beneath the fan vaulting, as always a little incredulous that we ate where the tonsured brothers had supped on sunlit Summer evenings nine hundred years earlier. Meal over, we set out to trace the lines of the old settlement. And it was not long before we had found the abbey itself: the site of the old altar, the place where the side chapels would have been. And there, growing into the wall behind the high altar, was the most grotesque old yew tree I have ever seen in my life. Its dark roots were thick and sinewy and though they were still, their lines had an unsettling static mobility about them, so that when my children asked to climb in its old limbs I had to think twice and pinch myself before I swallowed and said yes, of course. Ascertaining the age of a yew tree is notoriously difficult. But this old yew grew into, and out of, and over a wall belonging to an abbey which was demolished by Henry’s men in 1536. The tree and the wall are virtually one. It looks as though it was a smaller tree then. It is now 21 feet in girth: there is a tree of about 19 feet which was planted in the 12th century. It is possible- albeit barely- that this gnarled old sentinel was there when the first Cistercian monks arrived to set up a base in 1128. It is possible that it has presided like a living spectre over the past thousand years. Why was the yew tree there? At our iron age fort in Windsor Forest there are yews planted at two key entrances. Churchyards regularly boast huge, ancient yews within their bounds, yet no-one is sure why: to keep out cattle, maybe, or to protect and purify victims of the plague. We hug them to our holy places, a great grim living talisman. The tree which supplies wood of the longbow, used for a millennia as a panacea for the heart, the yew is an enigma which defies any attempt at ring-counting. Who can tell what they were for, or what they harbour? Or, even, what they are thinking? I hope fervently that I am never in a position for one of them to tell me. I’d never date a Yew tree 😉 – not my type at all! Very scary looking tree – amazing how trees can be both scary (especially at night and in a thick forest) and totally wonderful. You do visit some wonderful places Kate and your opening lines of your stories always grab me and make me read the rest. Gabrielle, my immediate reaction as well – never date a yew! A yew has dates? I thought you had to cross palms with silver or something to get those. A tree with its roots exposed sometimes seems a bit ‘undressed’. Like someone in a business suit, with bare feet? Definitely, Sidey. Although I would say someone in an undertaker’s outfit. But that’s me: gothic imagination. One good reason for planting yew trees is that they make a wonderful windbreak. Apparently, if you find a solitary yew tree, there will often be ruins or the site of an old house or church nearby, in the line of the prevailing wind. I had no idea about he prevailing wind theory, Jan! You remind me of St John River’s house on the moors, where Jane Eyre ended up after her flight from Mr Rochester. I think it was sheltered by yew, wasn’t it? Must check it out. A yew also served the purpose, in a churchyard, of keeping livestock away, as they are toxic to cattle. What a lovely day out, Kate. It was, Pseu 🙂 Thanks. That’s really interesting, Pseu – is the toxin in the leaves? A totally enthralling slide show containing some fantastic pictures. I spent my childhood very close to this area and never knew these wonderful ruins. Beautiful piece. Thanks, Roger 🙂 It was a stunning place, with the right weather to show it off. I look forward to you trips, so I can do my virtual traveling. I’m so glad you snoop for out-of-the-way spots. This was perfect. I didn’t realize the yew had significance beyond its healing powers. I hope your children were blessed for tickling its roots. Me too, Barb 🙂 From the barely known to the world famous: Hampton Court today…. It is, isn’t it, Tandy! My eyes nearly popped out when I first saw it! Very interesting place and the Yew tree is really cool. 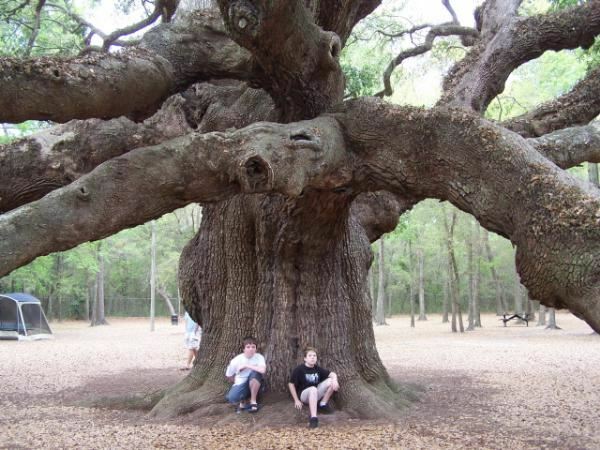 We have an old oak tree in Charleston called the Angel Oak that is thought to be about 400 years old. It doesn’t stand up in time to your Yew, but, it is a pretty awesome specimen. pic below. Wow, now that is an oak with personality, Lou 😀 Thanks! Brilliant picture. And oaks are not as long lived as yews….I wonder if there are any stories surrounding it? I was wondering the same thing as Kate, Lou. Any tales stemming from that impressive tree? The ruins are really stunning. I hate-th Henry the hate-th. You get official thanks and acknowledgement for my latest scribblings, btw. I hate-th Henry the Eighth too. Boo. And thank you! Great post about all the Carnarvon goings-on…..bravo. I have been described as a tree hugger. This tree would be impossible to hug and I would be afraid, very afraid, that it would want to hug me back! The yew brings to mind the tree in the Harry Potter series. What a fascinating day it must have been for you all in amongst the ruins. I wish I could have been with you. It was a cold, snowy winter’s day when we drove past Washington Irving’s Sleepy Hollow cemetery. Even then it seemed spooky. 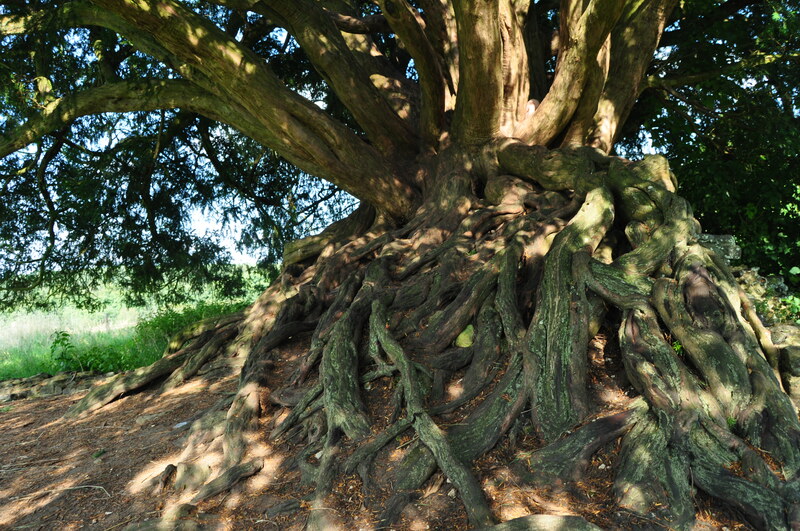 Dear Kate, like Penny, the abbey yew tree reminds me of the Whomping Willow of Harry Potter’s Hogwarts. The history that yew has seen in the presence of monks and Henry’s soldiers and marauders and visitors like you and your family who come and eat a peaceful picnic beneath fan-vaulted ceilings. Time stretching back so far. And how far forward? What will wanderers like yourself find in another thousand years? The arc of history and presence always awes me. Peace. It is awe-inspiring, Dee….these trees are in this for the long game. We gaze at something which has as any as ten times our lifetime. Yew Tress are creepy enough Kate. There;s a few in the Forest of Dean – tha tplace is weird enough but the Yews add a deathly spice to it all.Great post as always! Thanks Jim…the forest of Dean has always held a lot of stories, hasn’t it? I didn’t know there were yews there -will keep an eye the next time I go down! Charlie, thanks so much for that! I googles it and it seems builders have used a yew branch to ensure good fortune for the future since mediaeval times at least. I wonder if our tree was planted at the inception of the abbey?? Well, well thanks for that I didn’t know. As for your Yew it sounds like a possiblity. What a perfect spot for a picnic . . . beneath and beside the sheltering shade of ancient walls and arbors. A feast for the imagination. Thanks, Kate. It was just that, Nancy: perfection. Breathtaking in every way. When the sun deigns to shine here, it can take you like that. Eating in the monks refectory, and all. What a picturesque place. Trees are the oldest living things on earth; if only they could speak and tell us what they’ve seen! But there’s so much dignity in their silence. I’m not sure I’d change that for anything. You’re right, PT. We see them as enigmatic precisely because they are silent and long-lived. What they have seen will always remain a bit of a mystery. Compared to that ancient yew, the tree in the film “Tree of Life” was an embryo. I loved your slide show — and for glimpses of your tall-fry (Maddie looks VERY tall or maybe I just have short eyeballs) and of course, the family archaeological digger, Mac! We’re a tall family, LameAdventures…..and where would we be without that extra depth Mac adds to our research? The dog’s a canine Indiana Jones. Many Yews have been planted as way markers at the sides of what are now major roads. They stand out from other vegetation in both winter and summer. Great blog and pics Kate. Cheers Dad 🙂 I must look out for those! Gorgeous post, Kate, I just love your writing. I have to say I think that tree is beautiful. It’s a little creepy looking but I still love it. We don’t have yew trees or abbey ruins–and certainly nothing from the 12th century–on this side of the pond, so your photos are great for living vicariously through. One day, Weebles, you should come for a picnic. Maybe you would pick up on a few extra nuances. The monks would be a lot more receptive to you than to a lumbering family with moustachio’d dog. It would be amazing, wouldn’t it, Tom? When I come over there, I want to go there with you. Places like that speak to me, and one seldom gets a chance to linger very long. I shall put it on our itinerary. I recommend sun, though. The usual British weather does not show it off well. Like something out of Cooper of Alexander, that tree. I’m greatly impressed by the tree. Just imagine what it knows! I’d like to stand near and see what it could tell me! Perhaps I’d find it more ominous if I had your imagination! 🙂 The stonework in the abbey is simply magnificent! I’m very pleased you posted so many pictures. Recently a friend remarked how wonderful it is that a tree can block out the radiant heat of something so powerful as the sun – they are indeed wondrous, mysterious things. Tolkien also played on those ancient fears with his ‘Old Man Willow’ in the early part of The Lord of the Rings Saga but then went on to write about Ents – living moving treeherds whose role in the story is a good one but tinged with a dark side. There are loads of theories about why Yew trees appear in church yards – one suggests that the Yew was a gathering place for Pagan people to practice their religeous beliefs and it was therefore logical for the early christian church to build next to Yew trees and this subsequently transmuted to the traditional planting of Yew trees next to churches when they were built – my local church wasn’t build until 1846 but has a Yew tree within its sacred boundary. Another suggestion is that Yew trees were planted in church yards to provide wood for the Yeomen of England who were required to practice their archery every Sunday after attending service (sunday being the day of rest and therefore such practice didn’t interfere with their labours). The practice of Archery even seems to have been preached in the church services during Henry VIII’s time! With the medals for Archery going to other nations, it seems that the Yeomen of England have been neglecting their practice despite it still being a legal requirement for them to do so… The law lingers on whilst the Yeomen of England long since left the land for the furnaces of industry.